Today’s day-after-Christmas podcast opens with some holiday cheer (well, sort of! ), then gets to Parrish and Norlander’s top-three picks for National Player of the Year (6:15) as conference play is set to begin in earnest in the coming week. Then it’s Coach of the Year nominees (14:45), followed by the biggest surprises in college hoops (19:50) through November and December. As for disappointments (30:55), Parrish has a laundry list, while Norlander’s pick is outside the box. The guys close with their updated national title picks (38:20), both of which have changed from who they took in the preseason. When you take into account everything of consequence that happened in 2018, it’s not that hard to make the argument that the sport won’t see another year like this any time soon. 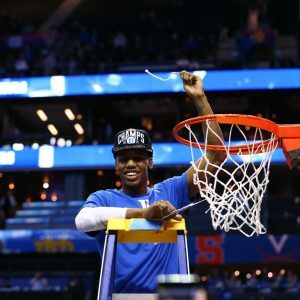 Vacated national titles, federal convictions, a 98-year-old nun becoming the biggest thing in sports, a 16 beating a 1, Zion Williamson, scandals, a change in how the sport is operated. Big year. So GP and Norlander get to that, but first open with Kentucky at Louisville, the game of the weekend in college basketball. From there, they run down six more games of note (15:45), including Nevada-Utah, Davidson-UNC, Wisconsin-Western Kentucky and Belmont-Purdue. Then it’s on to St. John’s (21:25) and it’s big game in the Big East opener at Seton Hall. But for the bulk of the discussion on this pod, it’s a look back at 2018 (30:20). The Runnin’ Bulldogs gave them a scare for a half. Well, that was fun there for a minute. Gardner-Webb took a halftime lead into the locker room against 1 seed Virginia before ultimately losing, 71-56. It started with a 6-4 Gardner-Webb lead. Everybody immediately got on Twitter to make their jokes, assuming that the lead would not last for more than a few minutes. And then the lead grew. And then it grew some more. Before we knew it, Gardner-Webb had taken a lead late into the first half. The consensus thought was that the Runnin’ Bulldogs needed to be up double digits to maintain their chances of an upset. They took a 36-30 lead into halftime, and Twitter was abuzz with the dream of another upset at the hands of Virginia. The program had to be prepared for the chance of it happening. Those dreams were quickly shot down. Virginia came out like a team that was worthy of a 1 seed and put the upset aspirations to bed before the first media timeout. 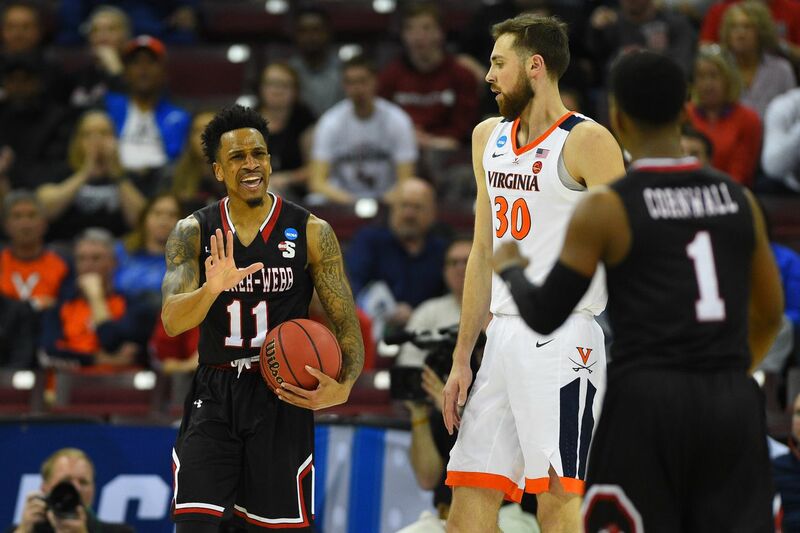 Virginia tightened up on defense, and the shots that Gardner-Webb was hitting in the first half all of a sudden went dry. Virginia extended the lead to double digits and the rest of the game was essentially a formality at that point. At one point, Deandre Hunter was outscoring Gardner-Webb in the second half, 17-16. It was Virginia’s defense, however, that propelled the Cavaliers to their win. Gardner-Webb managed to score just 20 points in the second half. Jose Perez led Gardner-Webb in scoring with 19 points, while David Efianayi and DJ Laster joined him in double digits with 12 and 10 points, respectively. 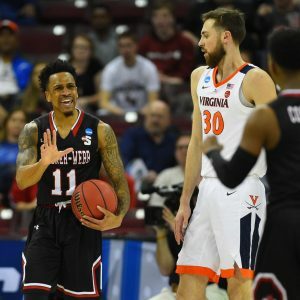 Gardner-Webb had their moment in the spotlight, and they can hopefully build on their first NCAA Tournament appearance moving forward. UCLA fell 73-58 (!) at home (!!) to Liberty (!!!!) on Saturday. Bruins coach Steve Alford does not seem long for that job now. Parrish and Norlander open on that and go back in time to the reactions from multiple media members in 2013, when Alford was hired by UCLA. Then they get into who could replace Alford in 2019 (20:10) before moving on to the dumpster fire that is the Pac-12 (35:05), which looks to be a two-bid league … if that. Elsewhere, Kentucky rounded closer to its best form by beating Louisville (44:15) and St. John’s (51:30) got jobbed in a loss against Seton Hall. 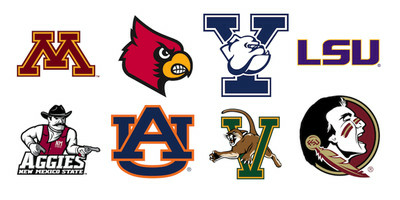 The first day of the NCAA Tournament is in the books and we now know what half of the Second Round matchups will be. On Saturday, 16 teams will battle for a spot in the regional semifinals, beginning with Maryland and LSU in the first standalone game on CBS. 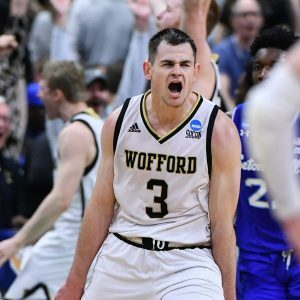 Wofford and Murray State were the two mid-major winners on Thursday (if you don’t count Gonzaga, they’re not a mid, blah blah blah). The Terriers get the second standalone game, also on CBS, coming shortly after the conclusion of Maryland vs. LSU. They’ll face Kentucky. 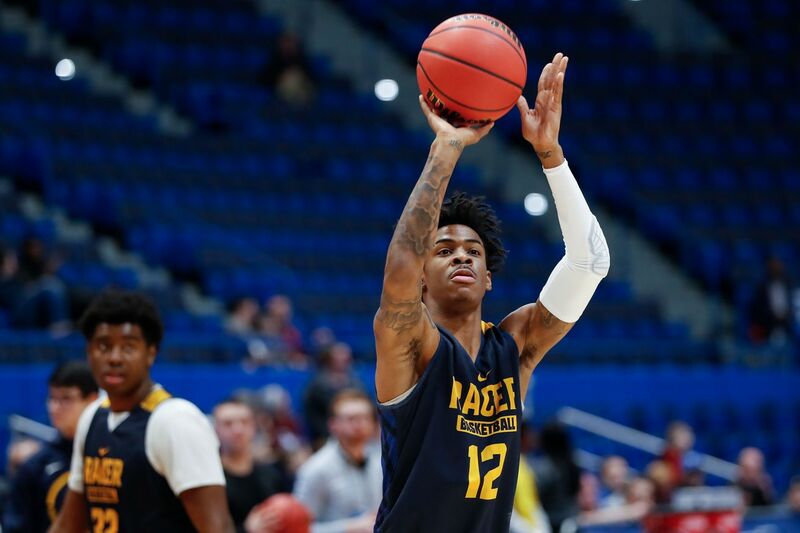 The Ja Morant Show takes centerstage at 6:10 p.m. ET from Hartford when the Racers take on Florida State. That game will air on TNT. The complete Saturday schedule can be found below, along with start times, TV info, and broadcasters. Games can also be streamed via March Madness Live. Sunday’s schedule will be announced shortly after the conclusion of Friday night’s First Round games. Early Monday morning, UCLA fired Steve Alford midway through his sixth season. That called for an emergency podcast from Parrish and Norlander. The guys start on the news, then discuss the problems with the expectations of what the UCLA job is (and isn’t). From there, there go deep into the candidate pool (20:40) and lay out a lot of names. Then, it’s time to preview some good games this week. In order: Marquettte-St. John’s (38:02), Nebraska-Maryland (40:40), Texas Tech-West Virginia (43:35), Oklahoma-Kansas (45:20) and Minnesota-Wisconsin (47:35). Happy New Year, everyone, and thanks for subscribing. If you haven’t already, please rate the podcast well and leave a nice review! West top seed Gonzaga and pair of No. 2 seeds, Kentucky and Michigan, are the marquee names in action on Thursday night. No. 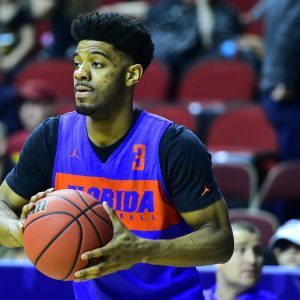 10 Florida Gators (19-15, SEC at-large) vs.
Nevada entered this season with high expectations following last season’s Sweet Sixteen trip, but the Wolf Pack has been tasked with a difficult matchup against Florida. 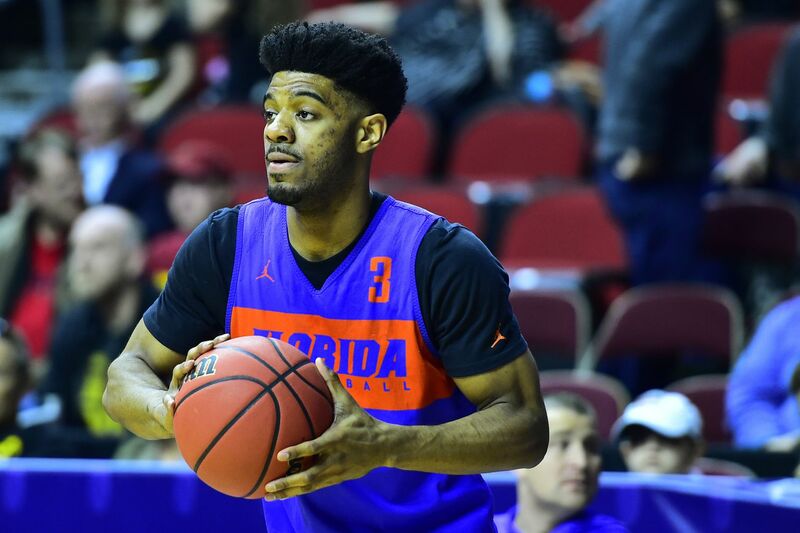 The Gators, making their third NCAA trip in a row under Mike White and eighth of the decade, last went out in the round of 64 in 2010. No. 15 Abilene Christian Wildcats (27-6, Southland automatic bid) vs.
Abilene Christian is making its first NCAA appearance as a Division I member, so the Wildcats are basically the polar opposite of their Kentucky namesakes, appearing for the 58th time. Eight of those trips have ended with a national title. No. 11 Saint Mary’s Gaels (22-11, WCC automatic bid) vs.
One of the most intriguing games of the night pits the defending national champs against a Saint Mary’s team that needed to win the WCC Tournament to even get in. The Gaels ahve won at least one game in three of their last four tourney appearances (2010, 2013, 2017), with that 2010 team knocking Nova off to reach the second weekend. As for the Wildcats, they’ve alternated second round exits with national titles over the last four tournaments. Jay Wright’s squad last failed to get past its first hurdle in 2013. No. 16 Fairleigh Dickinson Knights (21-13, Northeast automatic bid, First Four winner) vs.
Much like both OVC qualifiers played in the late afternoon session, both WCC entrants take the floor early on Thursday evening. On Thursday night, Fairleigh Dickinson recorded its first NCAA win in six attempts and while the Knights won’t be expected to win a second, Gonzaga’s history as a No. 1 seed offers hope that this game should at least be watchable. This will be the Bulldogs’ third round of 64 game as a regional anchor. In the previous two, they defeated Southern by only six (2013) and struggled with South Dakota State for a bit before pulling away to win by 20 (2017). No. 15 Montana Grizzlies (26-8, Big Sky automatic bid) vs. This is a rematch of last season’s West 3/14 game, which Michigan won by a 61-47 score. The Wolverines last went out in the round of 64 in 2012, while Montana last won an NCAA game in 2006. No. 10 Seton Hall Pirates (20-13, Big East at-large) vs. Given the shooting abilities of both teams (Myles Powell, Fletcher Magee), this matchup should be one of the more entertaining matchups of the day. 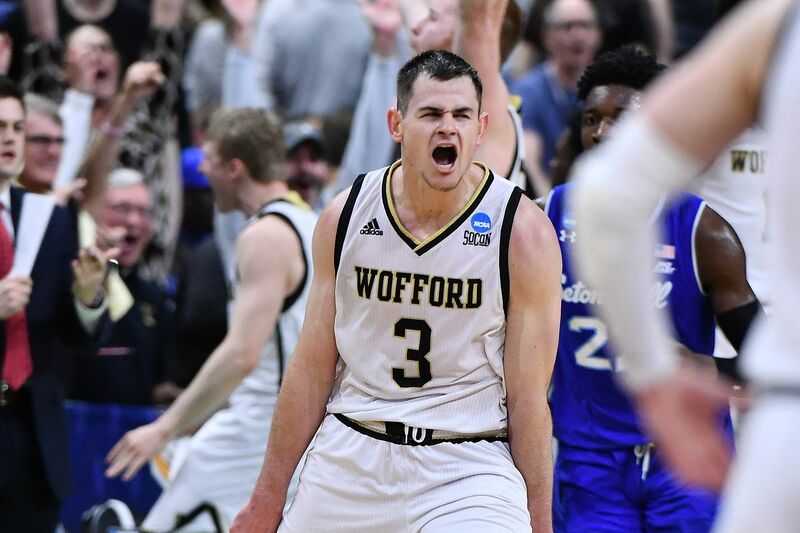 Wofford is aiming for its first NCAA win in its fifth attempt, all under Mike Young. Meanwhile, Seton Hall is making its fourth trip in a row, though 2018’s trip was the only one during that span featuring a win. No. 14 Old Dominion Monarchs (26-8, C-USA automatic bid) vs.
Old Dominion returns to the NCAAs for the first time since 2011, and it’s been nine years since they edged Notre Dame in the first round, 51-50. As for Purdue, the Boilermakers are aiming to make a third consecutive trip to the Sweet Sixteen, a run that followed a pair of round of 64 exits. No. 9 Baylor Bears (19-13, Big 12 at-large) vs.
Thursday’s final tip of features a Baylor squad back after taking 2018 off — this will be the Bears’ seventh NCAA appearance this decade and they’ve made it to the second weekend on four of those occasions. As for Syracuse, which will be playing without suspended point guard Frank Howard, the Orange have won at least once NCAA game in each of their last eight trips, dating back to 2009. A late rally earned the Bison their second ever NCAA Tournament win. For a moment, it looked like it would finally be North Carolina Central’s time in Dayton. Instead, a late North Dakota State rally sent the Bison to a date with top overall seed Duke, and the Eagles home with their third consecutive First Four loss. After having led by as many as 13 points early in the second half, NDSU found itself trailing 66-61 with just five minutes left. From there, the Bison would close the game on a 17-8 run, stiffening up and holding NCCU to just two field goals in the final 3:28. NDSU wing Tyson Ward (23 points) commanded the ball down the stretch, scoring seven points in the final two and a half pressure-packed, win-or-go-home minutes. That included a nifty isolation spin move along the baseline with just over a minute remaining. Junior point guard Vinnie Shahid added 14 points and three assists, including a pair of free throws with eight seconds to give NDSU a two possession lead and put the game out of reach. Jared Samuelson and Sam Griesel each scored 10 points. 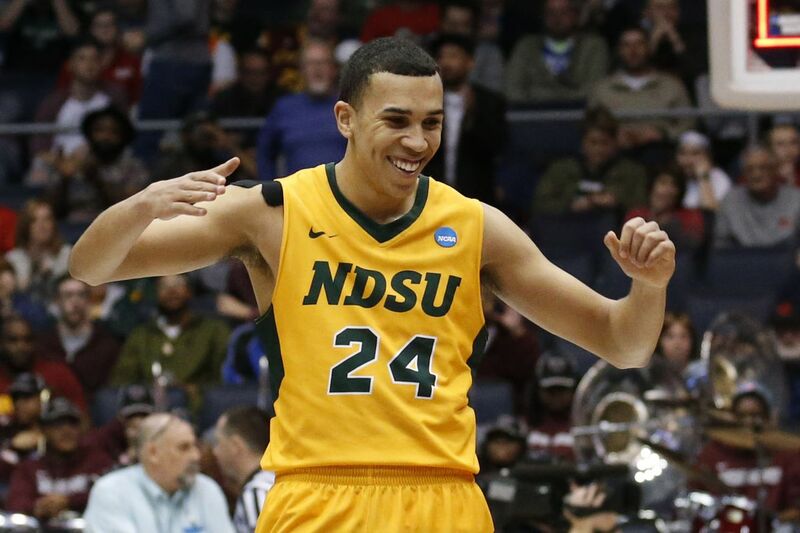 The final push gave NDSU its second NCAA Tournament since jumping to Division I in 2006. As a No. 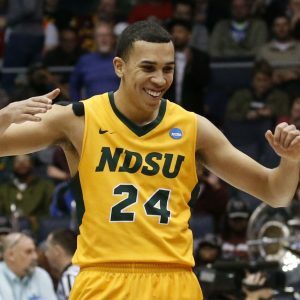 12 seed, the Bison defeated No. 5 seed Oklahoma in the 2014 NCAA Tournament. Regardless what happens against Zion Williamson and Duke, an NDSU team without any seniors has continued a March surge that began with its surprise run through the Summit League Tournament. The Blue Devils will, however, need to game plan for a team that loves to shoot three, and does it well (37.0% team three-point percentage on the season). The Bison went nine-for-20 from deep in the First Four, and Ward said after the game that that could be the path to a monumental upset. On the other end, the Eagles were within grasp of their first NCAA Tournament win in program history as they made their third consecutive trip to the First Four. NCCU found its offensive rhythm midway through the second half primarily behind senior wing Larry McKnight Jr. (20 points). Even as NDSU began to punch back, the Eagles seemed to plant a signature moment on the country. With just over three minutes remaining, NCCU point guard Jordan Perkins zipped a pass through the North Dakota State defense to set up a backdoor dunk by McKnight Jr. to put the Eagles ahead 70-68. 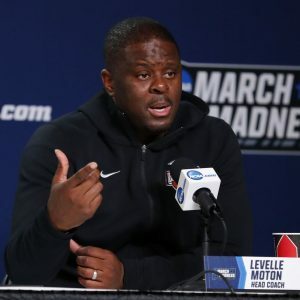 A quick-twitch half jump from LeVelle Moton and erupting bench looked destined to be an image of the 2019 NCAA Tournament. It wasn’t to be, and the emotion poured out of Moton in the post game press conference as he talked about his feelings for the six seniors on his roster. Two other seniors — Raasean Davis (20 points, 16 rebounds), Zacarry Douglas (14 points, 8 rebounds) — played big roles in addition to McKnight Jr. in what was essentially a six-man NCCU rotation. Despite the loss, the Eagles reasserted their dominance over the MEAC, winning the league tournament for the third straight season after finishing third in the regular season. A one-off episode that’s different from the usual Eye on College Basketball ep. Gary Parrish and Matt Norlander open with some thoughts on Rick Byrd and Belmont, which won over Fran Dunphy and Temple to move on in the First Four on Tuesday night. And from there, beginning at the 11:40 mark, the guys go through all 32 first round games and make their picks for which teams win and which teams cover. It’s an entertaining episode with a lot of insight. No better way to gear up for the start of the first round than this, we promise. At the end of the night, we’ll have an even bracket of 64. 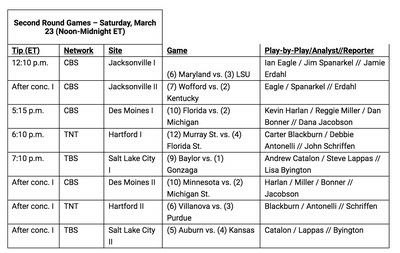 The NCAA Tournament‘s final First Four doubleheader of 2019 will air on TruTV. They have a channel finder in the upper-right corner of their schedule page. 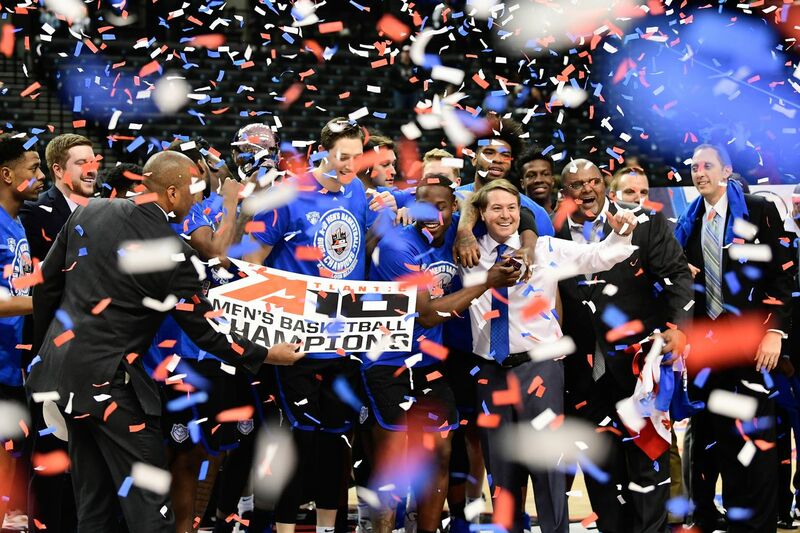 You can also stream the action on the NCAA’s March Madness Live. No. 16 North Carolina Central Eagles (18-15, MEAC automatic bid) vs.
N.C. Central is making its fourth NCAA appearance and third in succession. 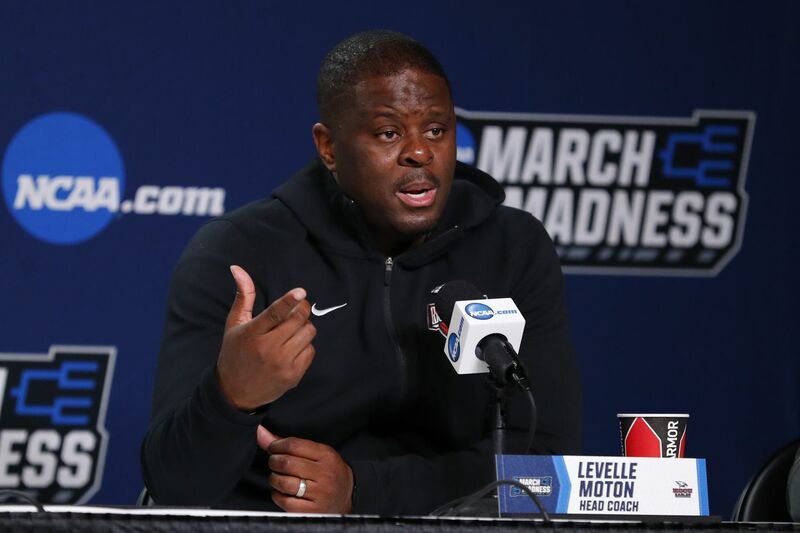 LeVelle Moton’s Eagles’ are looking for their first win, however. They’ve only been placed in the main draw once, a 93-73 loss to Iowa State in 2014. In other words, this is their third straight trip to Dayton and they’re 0-2. As for North Dakota State, this is also their fourth NCAA trip, but only their first opening round experience. The Bison made back-to-back trips in 2014 and 2015, with the first of those teams earning a 12 seed and upset win over Oklahoma. Tonight’s winner takes on the No. 1 overall seed in the bracket, the Duke Blue Devils, on Friday night at 7:10 p.m. on CBS. No. 11 St. John’s Red Storm (21-12, Big East at-large) vs.
Bobby Hurley’s Sun Devils have now made consecutive NCAA Tournaments — and consecutive trips to Southwestern Ohio. Arizona State last played in the round of 64 in 2014, a two-point loss to Texas. As for St. John’s, this will be the Red Storm’s 30th NCAA appearance, but first in Chris Mullin’s four seasons in charge. Tonight’s winner will end a sizable NCAA victory drought. The Sun Devils last claimed an NCAA win a decade ago (2009), while the Red Storm have been waiting since 2000, though that result was vacated. The winner of this one will take on the sixth-seeded Buffalo Bulls, Hurley’s previous employer, on Friday afternoon at 4 p.m. in Tulsa on TNT. The West is unbalanced: The 1 and 4 seeds in the West are in the Top 5 of the Pomeroy ratings while the 2 and 3 seeds are 20th and 19th, respectively. This is the best Gonzaga team we’ve ever seen, and they annihilated a solid WCC by an obscene 0.37 PPP. At the same time, this West Virginia team was more than just “Press Virginia”, as they proved to be able to keep up their offensive efficiency in conference play in ways that they weren’t the past couple of seasons. If you want to take West Virginia to your Final Four, by all means go with that. Notre Dame was handed a brutal draw: Princeton is one of the best teams to ever come out of the Ivy League, and will be a handful in the first round, and that’s before the Irish can get to Pomeroy #5 in the second round and Pomeroy #1 in the Sweet 16. They’ve played really good basketball over the last month, but that draw is a nightmare if you want to pick the Irish to go far. Saint Mary’s is a great Sweet 16 sleeper: The thought when Arizona got Allonzo Trier back was that the team would get significantly better. Oddly, they’ve actually performed slightly worse (statistically) with him than without him. Even if you believe that the computers are slightly underrating Arizona, they are still a borderline Top 20 team at best in most computer ratings, and thus a very weak 2 seed. Throw in a relatively soft 10 seed in VCU and Saint Mary’s is perfectly positioned for a Sweet 16 run if they can hit their open shots. 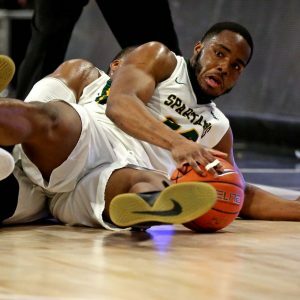 Xavier has righted the ship: It’s not surprising that Xavier tailed off after losing Edmond Sumner, but they do seem to have righted the ship over the last week or two. They’re not the borderline Top 20 team they were with Sumner, but they’re still a Top 40 team in the Pomeroy, the BPI, and Sagarin, and are facing a weak 6 seed in Maryland. Vegas has opened the line with Maryland as 2 point favorites, but I find that it’s generally a good bet to take lower seeds in toss-up games. That said, Florida State is a tough 3 seed, and so unless your bracket pool offers large bonuses for picking upsets I wouldn’t get too greedy in picking Xavier to go far. Tuesday night marked a significant milestone in Rick Byrd and Belmont’s postseason history. 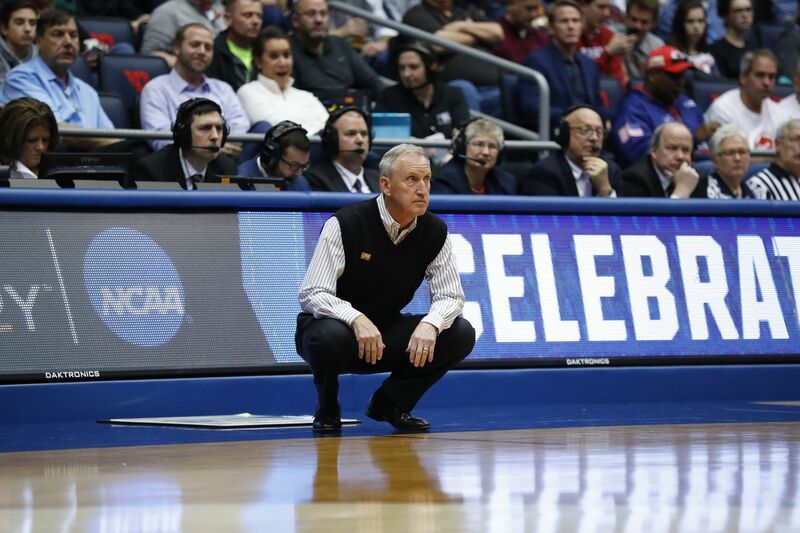 DAYTON — Rick Byrd knew the ramifications of what had just transpired as he took the podium following his team’s 81-70 win over Temple in the First Four of the NCAA Tournament. It was a milestone night for not just him, but for the Belmont basketball program as the Bruins earned their first NCAA Tournament win in school history on Tuesday night. It’s true that at this time three days ago, Belmont wasn’t even sure if it would be in this position. The Bruins were over a week removed from a loss to Murray State in the OVC Championship game, relegating them to life on the bubble with their fate in the hands of the Selection Committee. It was a long week for the Bruins, as is the case when you’re unsure of your postseason fate. But Belmont was in a different situation than a lot of other teams on the bubble. “It was tough. Obviously it was a lot of waiting around. We’re one of the first conference tournaments out there. So it’s a full week of just waiting around. It was our spring break. So we got a few days off, which was nice,” senior forward Dylan Windler said during Belmont’s media availability on Monday before the game. Their resume was set in stone, and with other bubble teams still playing, it took patience and a positive outlook to stay grounded. “But it was hard just because you’re out of control at that point. You can’t really control your own destiny, which kind of stinks. But it’s watching a lot of basketball, like you said, rooting for certain teams that you wouldn’t normally have to. So we had a lot of that to do and just try to stay patient and stay optimistic and that’s what we did,” Windler said. When Belmont’s name flashed across the screen the Bruins found out they’d be headed to Dayton, the reality set in that there was work to be done. Belmont was presented with an opportunity to silence any critics that said they weren’t deserving of an at-large bid. Rick Byrd relished the opportunity to go out and prove that the Bruins are legit. “There’s been a lot of people that have been promoting our cause, and I don’t know if it’s about carrying the mid-major flag as much as it is the Belmont flag. And just playing like those guys said we could play,” the legendary head coach said on Monday. And Belmont went out and did just that. It wasn’t their best performance in terms of efficiency or gaudy statistics, but the potent Belmont offense was out in full force on Tuesday. The Bruins found ways to score inside and out, in transition and in the halfcourt, and through designed sets or fluid offensive motion. Nick Muszynski had his way on the left block. McClain was the best player on the floor en route to a game-high 29 points. Every player that stepped on the floor for Belmont found their way into the scoring column. At different points during the game, Temple made their runs to pull ahead. Every time, the Bruins showed that the moment wasn’t too big to rattle them as they battled back with runs of their own. Temple had a 14-2 run in the first half and a 12-2 run early in the second half, but neither was enough to hold on to the lead for more than a few minutes as Belmont continued to run their stuff and get whatever look they wanted on offense. Beyond the obvious impact of what a win in the NCAA Tournament does for a program, it gives Belmont a feeling of vindication that it was deserving of an at-large bid despite what critics might have said. For Windler, there was a little bit of extra motivation to prove that the Bruins belonged with the best of the best. “I would just say motivation, just proving ourselves and proving to not only the committee but everyone that supported us over the week to help us get in the tournament, all the supporters and everything, just motivation to prove to them that we’re a really good team. We deserve to be in this tournament,” the senior forward said post game. 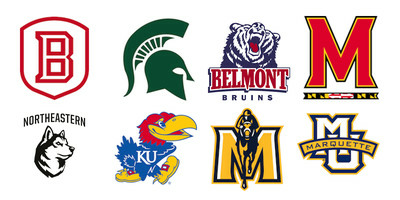 Belmont found itself in a position that few mid-major programs get the chance to be in. At-large bids to the NCAA Tournament have become increasingly rare for mid-majors, and it’s been a common practice for the Selection Committee to send one to Dayton for the First Four. For Windler and Belmont, there’s hope that teams like them can continue to make the Selection Committee think long and hard about excluding a team of this caliber. With the opportunity that was put in front of them, Musyznski had one thing on the mind: prove them right. “We wanted to prove them right. A lot of people would probably say they took a chance on us being a mid-major that doesn’t have a ton of great wins or a ton of bad losses. We beat the teams we were supposed to beat and lost games people expected us to,” he said postgame. With another 48 hour turnaround awaiting the Bruins before taking on No. 6 seed Maryland, there won’t be time for Belmont to get complacent with the win. But until they get back to work on Wednesday in Jacksonville, the Bruins can enjoy the monumental step in the program’s history knowing that they went out and showed that they truly belonged in the Big Dance. For the 10th tournament in succession, Dayton hosts the first of two of doubleheaders in as many nights. Both tonight’s NCAA Tournament doubleheader and tomorrow’s will air on TruTV, as always. They have a channel finder in the upper-right corner of their schedule page. You can also watch on the NCAA’s March Madness Live. No. 16 Prairie View A&M Panthers (22-12, SWAC automatic bid) vs.
Fairleigh Dickinson is 0-5 on its previous NCAA trips, the last of which came in the 2016 First Four, Prairie View is 0-1, losing in the 1998 First Round to Kansas. Tonight’s victor heads to Salt Lake City to take on the West’s top seed, the Gonzaga Bulldogs, at 7:27 p.m. Eastern, also on TruTv. No. 11 Belmont Bruins (26-5, OVC at-large) vs. 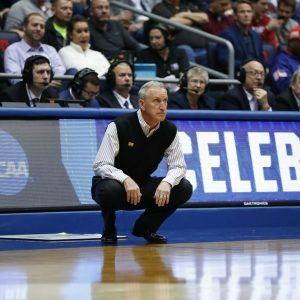 While this will be Belmont’s eighth NCAA trip, all of which have come under head coach Rick Byrd and since 2006, they’ve failed to win a game in any of their previous seven appearances. On the other hand, Temple has made the field 32 previous times, the last being in 2016. The Owls last won in 2013. 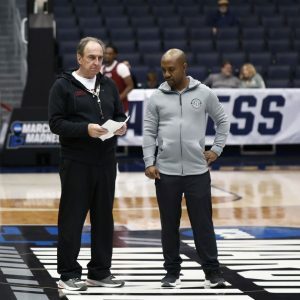 With a loss, Temple head coach Fran Dunphy will head into retirement, after eight NCAA appearances at Temple and nine at Penn. The Belmont-Temple winner will travel to Jacksonville for a First Round game against the East’s No. 6 seed, the Maryland Terrapins, which will tip at approximately 3:10 p.m. Eastern and appear on … TruTV. Don’t get too cute: Want to pick a 10 seed to the Sweet 16 or a 4 seed to the Final Four? Have some fun, particularly when you are in a pool with a lot of contenders or where upsets are rewarded. But I generally recommend staying away from low seeds for your title game teams, because you really risk having your bracket blow up in your face during the opening weekend. The fact is that the Final Four is likely to be heavy on 1 and 2 seeds, so don’t fight it. If some 11 seed makes the Final Four, the odds are that you aren’t going to get lucky enough to pick that team anyway. Look for balance: In general when picking Final Four teams, look for teams that are in the Top 20 of both Pomeroy offensive and defensive efficiency, or at least something right around there. While some unbalanced teams have managed to get through to a championship by being incredible on one side of the ball, history says that you want to pick balanced teams, as they are less likely to be undone by a single thing going wrong. An example team that I would stay away from, for example, is UCLA. Bracket difficulty matters: When two teams you are deciding between seem like relatively equal opponents, look to see who had the easier path to get there. Which team is more likely to get taken out early? In my bracket, that led me to stay away from Villanova, who are likely going to have to face two very difficult opponents (Wisconsin and then either Florida or Virginia) before they even get to an Elite 8 game. In contrast, North Carolina and Duke were given total cakewalks to the Elite 8. It’s not a coincidence that those are the two teams I have in my title game. Who is the best team? 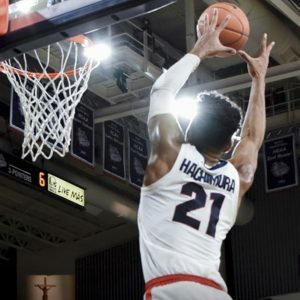 : Gonzaga is #1 in most metrics, though it’s fair to assign a slightly larger statistical uncertainty to them than to a team that has faced a more consistently difficult schedule. Villanova is the defending champs and might just be the best team in the nation, though as I said earlier their bracket is a nightmare. The most talented roster of all, and the team that is finally humming at the level that we were expecting all season long, is Duke. There is such a ridiculous amount of talent and athleticism there that I was leaning toward taking them as my national champion pick even before the brackets were released. The fact that they have a relatively soft path to the Elite 8 and that the 1 seed in their bracket has a greater than 50% chance of failing to make the Elite 8 in most computer models seals it for me. Duke is my pick. 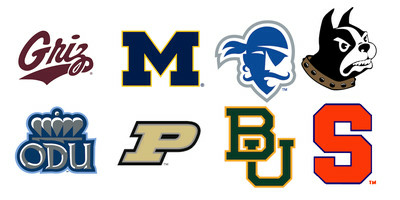 01/06: Who will be the last undefeated team — Virginia, Michigan or Houston? Matt Norlander’s Chicago Bears lost a playoff game to the Philadelphia Eagles in the worst possible way, so he and Gary Parrish open this episode on that, with Norlander just trying to talk through the aftershock. But there’s plenty of hoops to get to. First up is Nevada (11:34) losing its undefeated season. Then the guys touch on whether Virginia, Michigan or Houston will be the final unbeaten team (17:05). Bad news came down twice for Kansas (21:32) over the weekend, an Kentucky (28:43) didn’t emerge with a win either. Meantime, Virginia Tech (35:03) is highlighted for the first time this season on the podcast. The guys close with a preview of Tuesday’s big game (39:34): UNC at NC State. Zion Williamson finished with 30 points, 10 rebounds and five assists in Tuesday’s 87-65 win at Wake Forest. So he’s now the first freshman in Duke history to hit each of those numbers in the same game. Gary Parrish and Matt Norlander open on that. And then it’s to Tennessee (7:17), UNC’s win over NC State (13:23) in addition to the possibility the Tar Heels finish atop the ACC. 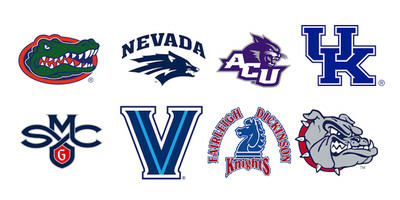 As for Nova (21:07), is it going to win the Big East in the same season it lost to Furman and Penn? The guys wrap (29:01) talking Wednesday night’s schedule” No. 11 Auburn at Ole Miss, No. 17 Houston at Temple and No. 21 Marquette at Creighton. Which ranked team will get picked off on the road? Markus Howard became the first Division I player in the past 20 years to have multiple 50-point games when he got 53 in Wednesday’s win at Creighton. So Parrish and Norlander open this episode with that (and camels). 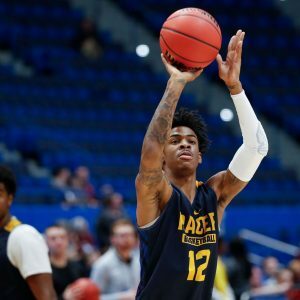 From there Murray State’s Ja Morant destroyed a UT Martin Skyhawk on Thursday (12:31); a loaded weekend preview (16:09), including No. 3 Tennessee at Florida, No. 4 Virginia at Clemson, No. 5 Gonzaga at San Francisco, No. 6 Michigan State at Penn State, No. 7 Kansas at Baylor, No. 8 Texas Tech at Texas, No. 10 Nevada at Fresno State, No. 16 Ohio State at Iowa and No. 22 Indiana at Maryland). The big game No. 1 Duke at No. 13 Florida State (25:53). And also, CBS’ big game on Saturday (31:40): Ole Miss at No. 14 Mississippi State. This episode is sponsored by www.ZipRecruiter.com. Below, you will find links to my bracket breakdown. I choose the winner of each game, by region and then in the Final Four itself. Don’t expect a breakdown of each game, but rather some larger observations about what to watch out for, what to focus on in your bracket pool, and where I would recommend taking risks and chances. Look for the picks against the spread each day on the blog. I will be picking each game against the VegasInsider consensus line spread. No teases needed. THIS EPISODE IS THE GOODS. Complete NCAA Tournament reaction, analysis and everything you want for the morning after Selection Sunday. 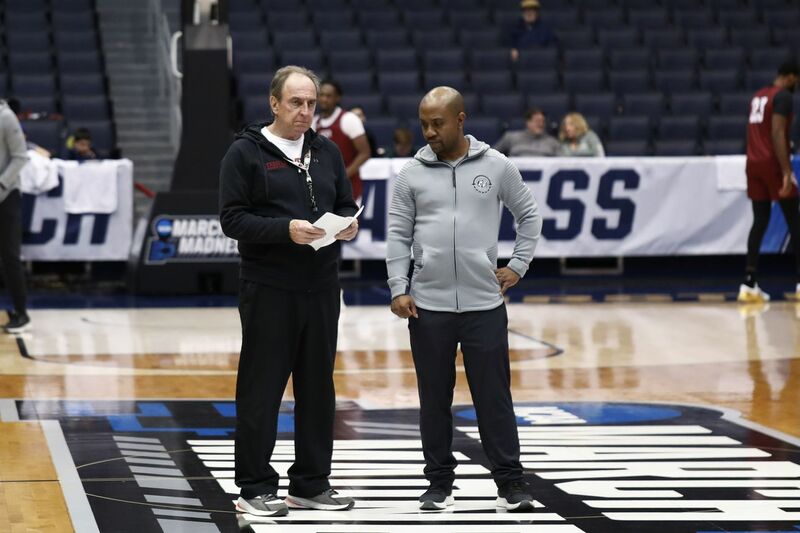 Here’s how Gary Parrish and Matt Norlander sort through the bracket on this episode: the opening is first impressions about what the committee did and anything that stands out in a major way. The nitpicking is next (16:00), and then comes the region-by-region analysis. East is first (26:15), then West (36:30), then South (43:00), then Midwest (56:30). 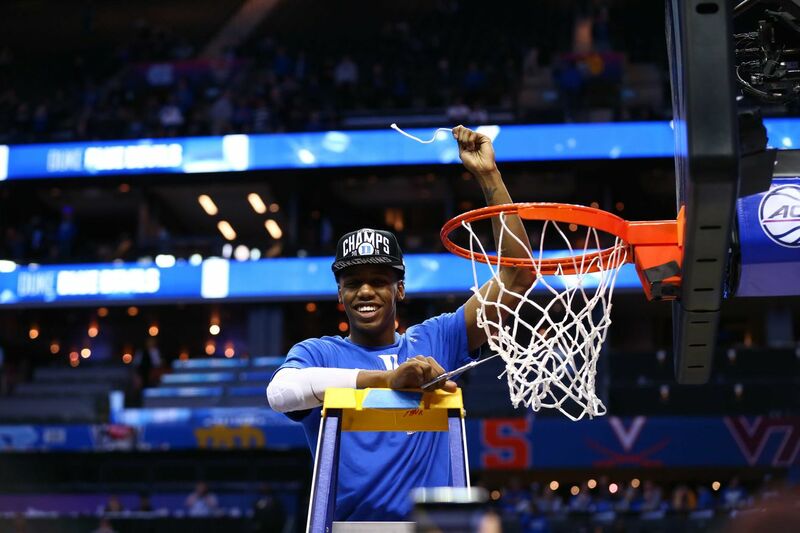 The pod wraps with Final Four and title picks (1 hour, 7 minutes). One more for the road to Minneapolis. Auto bid holders in this section are noted by the conference names in parentheses. If a team has won its league’s auto bid, it appears in ALL CAPS (ignore any teams known by their abbreviations here). For at-large candidates only, the numbers in parentheses after the team’s name are as follows: record vs. D1 opposition/record in Quad 1 and Quad 2 games/record in Quad 1 games only. Records and NET data reflect games played through Saturday, March 16. I pulled the quality win info from WarrenNolan.com’s selection sheets. This is Day 1 of my daily “Picking The Lines” posts. Remember that gambling is for fun only, and this is really just a blogging gimmick to talk about each game. Never bet significant sums of money on sporting events. As always, the Vegas lines used will be the VegasInsider consensus line at the time the post goes live on the blog. Anyway, it’s time to get this tournament started. Join in the comments section on these posts daily to talk about the games as they happen, or tweet at me. New Orleans (-1.5) over Mount St. Mary’s: You have to be a gambling degenerate to actually throw real money on a 16/16 play-in game. That said, with a spread this small I’m just going to pick whoever I think is going to win the game. 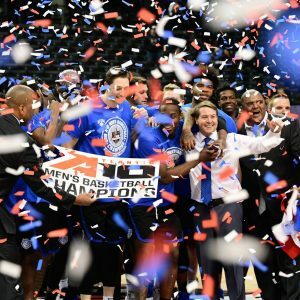 New Orleans isn’t just the team higher rated in the computers, but they’re a more athletic team, with the ability to apply a lot of defensive pressure and to get to the line in a way that Mount St. Mary’s simply can’t. Kansas State (PK) over Wake Forest: Kansas State is a team that I didn’t think deserved a spot in the NCAA Tournament due to a very mediocre non-conference strength of schedule, conference W-L record, and RPI Top 50/100 records. That said, they are better than their resume, suffering from a little bit of bad luck in close games. Also, the Big 12 was just ridiculously strong, with no opportunities for easy victories. Both of these teams have mismatches, from Kansas State’s pressure defense to Wake Forest’s John Collins inside, but when all else fails I give the coaching advantage to Bruce Weber. Criticize Weber’s recruiting all you want, but he’s one of the best game coaches that you’ll find in Division I basketball. Before tip-off, Utah State and San Diego State fans chanted the famed “I believe that we will win” chant at the Thomas and Mack Center. In the end, it was the Utah State fans who were able to cheer victoriously. 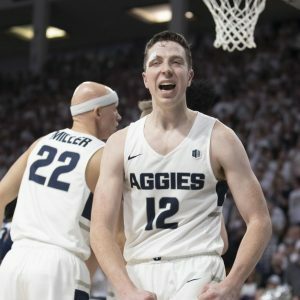 Sam Merrill lead Utah State 24 points and big man Neemias Queta scored 17 points and added 8 rebounds leading the Aggies 64-57 victory in the Mountain West Championship game. The Aggies used a strong second half start to pull away from the Aztecs. The first ten minutes of the game resembled a rugby scrum. Both teams struggled to get it going offensively; the teams combined for 17 points in the first nine minutes. However after consecutive big from McDaniels and Queta both teams started to find their rhythm offensively. Utah State would hit its next five shots and San Diego State was able to hang around with help of a couple of Watson threes. The teams traded baskets down the stretch to what was an entertaining first half. Utah State took a 34-32 lead into the break despite Sam Merrill failing to make a single three pointer. At the start of the second half the Aggies asserted themselves by going on a 13-0 run. San Diego State tried to battle back but Utah State prevented the Aztecs from getting anything going offensively. The Aztecs shot a miserable 27 percent from the field in the second half. The Aztecs defense would effectively get stops but they struggled to make a run as the Aztecs offense began to sputter. San Diego State struggled to get open looks and move the ball efficiently. Jalen McDaniels was held in check offensively through the entire stretch. As the game seemed to get a hand for the Aztecs, Brain Dutcher’s squad kept fighting. SDSU remained within 12 despite a 2:09 minute scoreless stretch. After losing McDaniels with 5:55 left to go, the Aztecs were able to make short run. SDSU began to pressure the ball and play very aggressive defensively. SDSU was able to create buckets on Utah State turnovers. Watson hit a three with four minutes to go to bring the Aztecs to within single-digits for the first time since the 15:00 minute mark. San Diego State got many chances down the stretch but couldn’t convert. Mitchell missed two consecutive open threes to bring it within five. Down by seven, San Diego State missed back-to-back front ends of the one-and-one. Utah State left the door open for comeback, but the Aztecs still couldn’t deliver. With McDaniels out of the game, Utah State was able to focus on stopping Watson. Utah State did an excellent job fighting over screens and forcing Watson off his right hand. Despite being guarded by an army, Watson still hit big shots down the stretch to keep the Aztecs hopes alive. San Diego State was able to stay in the game due to their 15 offensive rebounds but the Aggies prevented them from scoring any second chance points. 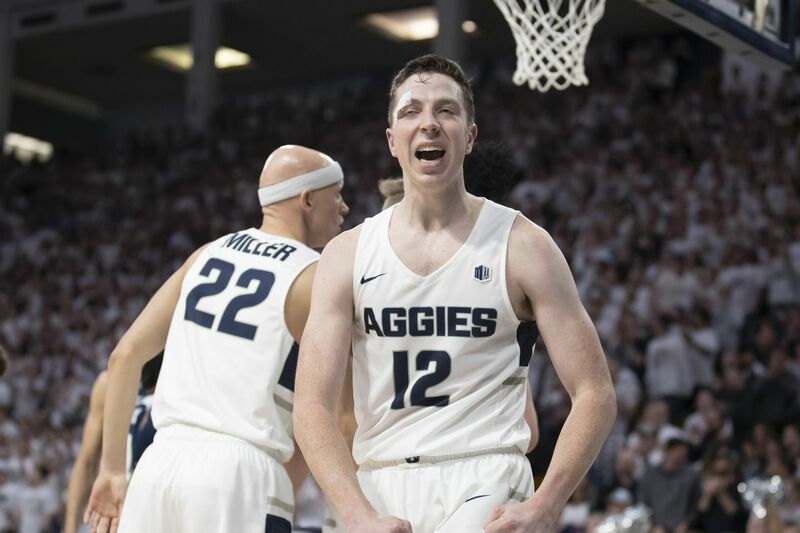 Utah State clinched its first Mountain West tournament title and left no doubt about their spot in the NCAA Tournament. The title was the finishing touch on first-year head coach Craig Smith’s memorable turnaround. 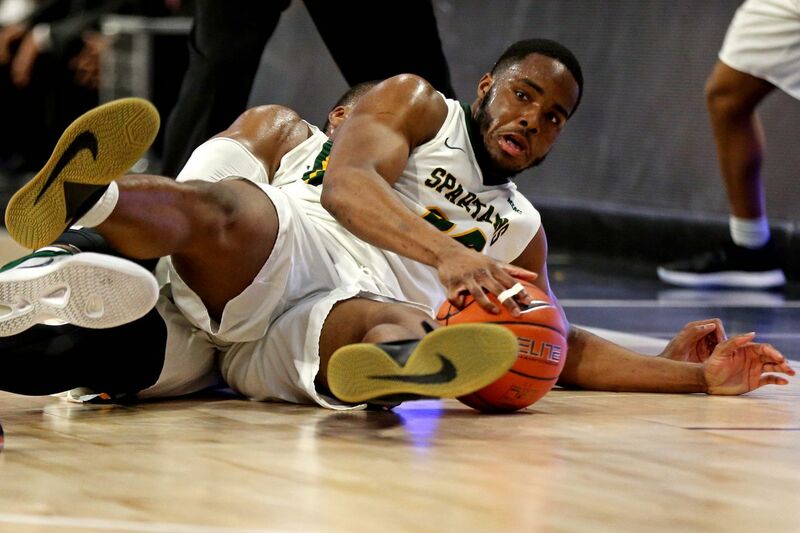 He took a program who finished seventh in the conference and was picked ninth in the Mountain West preseason poll — all without leading scorer Koby McEwen, who transferred to Marquette in the offseason. Now, the Aggies are poised for possibly a deep run in March. When Brian Wardle became Bradley’s head coach, there were virtually no players on the roster and the passionate basketball fans in Peoria, Illinois were discouraged and wondering if basketball relevance would ever return to Carver Arena. Wardle’s first team was the youngest in the nation and it won five games. Wardle’s second team was one of the youngest teams in the nation and it won 13 games, but Wardle was building a program one brick at a time. Now, Wardle’s Braves have produced back-to-back 20-win seasons. The former Marquette player says his building plan was informed by the children’s story, The Three Little Pigs. On Jan. 16, the Braves were 0-5 in the Valley and were 8-10 overall. 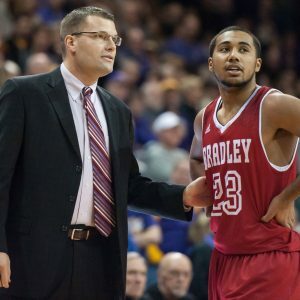 Wardle tweaked his lineup, his team started making shots they were previously missing, and they sprinted to a 12-4 finish and a Missouri Valley Conference Tournament title. Junior guard Darrell Brown is the team’s leading scorer, three-point shooter, ball-handler, and steals leader. The 5’10 point guard is a streaky offensive player. His 14.7-point scoring average does not reflect his explosiveness. After opening the Valley season with a two-point performance against Northern Iowa, the Memphis native went off for 32 against Indiana State. 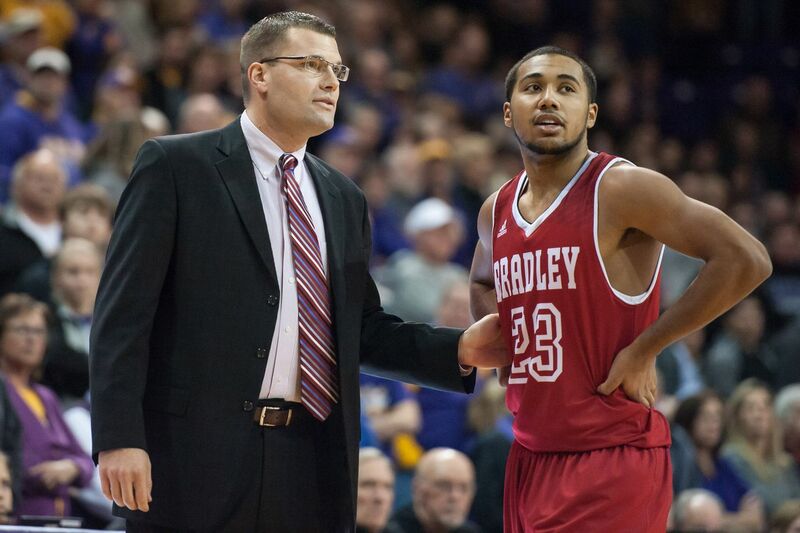 Counting the Valley tournament, he torched MVC opponents for six games of 20 points or more. He also had six where he failed to reach 10 points. He was a second-team all-Valley member. Sophomore forward Elijah Childs was the Most Outstanding Player of the Valley tournament. The 6’7 lefty has solid post moves and a solid mid-range game. The Kansas City native recorded seven double-doubles on his way to a third-team all Valley season of 12.2 points and 7.8 rebounds per game. He was also named to the league’s Most Improved Team. London native Dwayne Lautier-Ogunleye was the clutch free-throw-making, heart-and-soul of Bradley’s Arch Madness championship game victory. He made all six of his free throws during the final two minutes of the Braves’ three-point win over Northern Iowa. His overall game (8.6 points, 5.4 rebounds and 2.2 assists) reflects his grit and leadership. The senior guard scored nine of his 13 points in the final 3:44 of the title game. Wardle says making those clutch free-throws isn’t just a reflection of his tenacity; it speaks to his hard work. He shot under 60 percent from the line his freshman season and made 75 percent this year. Wardle speaks often of star role players. He wants players to see their role as important and how little things win championships or lose games. Senior Luuk van Bree is a screen-setting, shot-blocking, triple-making star role player. His defense on Loyola’s Cameron Krutwig in the Valley semifinal was game-changing. Third-leading scorer Nate Kennell comes off the Bradley bench and shared the Valley’s Sixth Man of the Year award. He averages 9.4 points per game and makes 40 percent of his shots from distance. Senior Luqman Lundy, junior Koch Bar and freshman Ja’Shon Henry all average 18 minutes per game, at least four points, and fill multiple gaps. Wardle says his Braves are selfless. No one cares who scores or who gets the headlines. They’ve built their team on the bricks of doing the little things that lead to championships. When pregame introductions are made, all the players stay in one big circle. When Lautier-Ogunleye was congratulated for making those game-winning free throws, he credited his teammates for believing in him. Wardle is a fierce competitor and his team, which also won the Cancun Challenge, emulates their leader. North Carolina continued its bipolar ways this weekend. Just five days after winning at NC State, the Tar Heels lost 83-62 at home to Louisville. GP and MN open with that, then get to Cam Reddish (15:27), who buried a 3-pointer in the final second to lift Duke past Florida State on Saturday. Ohio State (28:51) has gone from 12-1 to 12-4, and the Big Ten has 10 teams thinking NCAA tourney. In the SEC, Ole Miss (29:38) is 13-2 overall, 3-0 in the SEC. Gonzaga (38:16) beat a better-than-you-realize San Francisco team on the road late Saturday to improve to 16-2. Will Gonzaga not lose again until March? And finally, previewing Virginia Tech-Virginia (50:32), which takes place Tuesday. Monday night brought the unexpected: not just a Duke loss to Syracuse, but Tre Jones’ troubling shoulder injury that is expected to keep him out for a while. Parrish and Norlander open this episode by discussing the game and the injury, then get to Indiana (20:45) losing at home to Nebraska. With a tough schedule upcoming, could the Hoosiers go from comfortable NCAA Tournament team to the NIT? The guys also touch on Pitt (29:15), which is doing well in its first year under Jeff Capel.